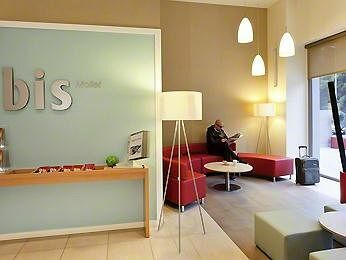 With a stay at ibis Barcelona Mollet in Mollet del Valles, you`ll be within a 10-minute drive of Circuit de Catalunya and Autonomous University of Barcelona. This hotel is 12.9 mi (20.7 km) from Sagrada Familia and 14.8 mi (23.8 km) from Park Guell. Make yourself at home in one of the 118 air-conditioned rooms featuring LCD televisions. Complimentary wireless Internet access keeps you connected, and satellite programming is available for your entertainment. Bathrooms have showers and hair dryers. Conveniences include phones, as well as safes and desks. Enjoy a meal at the restaurant or snacks in the hotel`s coffee shop/café. Quench your thirst with your favorite drink at the bar/lounge. Buffet breakfasts are served on weekdays from 6:30 AM to 10:30 AM and on weekends from 6:30 AM to noon for a fee.